If you’re considering a bathroom remodel in Downriver Michigan, you’ve most likely come across the overwhelming pros of remodeling your bathroom. For example, a bathroom remodel often increases your overall home value, as well as makes your home more comfortable and potentially fixes any structural issues you may have had. Not to mention the additional functionality that you can have from taking advantage of some of the latest technology. A bathroom remodel can also make your home more energy efficient, but most important it can be just like you want it. While there are a lot of pros for remodeling your bathroom, there definitely are a few cons. 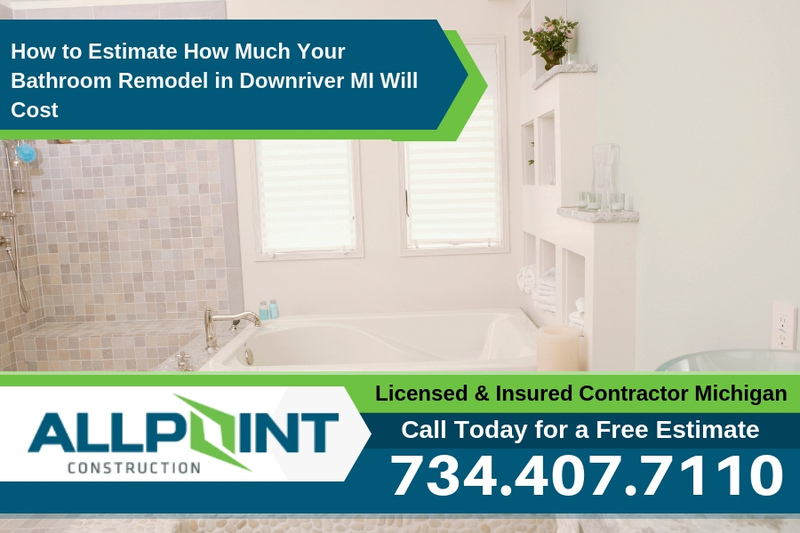 One of the biggest cons of a bathroom remodel in Downriver Michigan is the price of the project. But, you don’t have to break the bank to remodel your bathroom. Just check out our small guide below to learn more about the average price of a bathroom remodel and how you can stick to your budget. While many people consider a bathroom remodel projects something of a do it yourself project, don’t be fooled. You’ll need a fully qualified home improvement contractor in Downriver Michigan to get a bathroom remodel project done. For simple projects you may be able to do some of the project yourself but for anything that involves plumbing or electrical you’ll certainly need a full licensed contractor. Bathtub – You might be surprised to learn that bathtubs can cost as little as $400. Of course, the larger and more extravagant tub you want, the more you’ll have to pay. Some bathtubs cost as much as $8,000. But, if you’re looking for an average sized modern tub with advanced function, be ready to pay around $1,000. Cabinets – Cabinets range anywhere from $1,200 to $13,000, with the average cabinet remodeling costing around $2,100. Countertops – Similar to cabinets, countertops run as low as $900 and up to $6,500. But, the average homeowner pays around $1,700 for new countertops. Flooring – Of course, the price of your flooring is dependent upon the size of your bathroom and the material you use. But, flooring can cost anywhere from $800 to $5,000. Lighting – If you want to simply add a new lighting system or subtly tweak the lights you currently have, lighting can cost as little as $120. But, if you want to completely revamp your bathroom lighting with advanced modern technology, you could pay up to $4,000. Sink – A new sink could cost you anywhere from $1,400 to $6,500. Toilet – Surprisingly, toilets aren’t that expensive. Priced at $210 to $1200, it will most likely be the cheapest aspect of your renovation. It’s important to note that these prices are just estimates you can use as a loose guideline. Of course, exact prices are determined on a variety of factors, such as where you live, the materials you use, and your contractor. For a better estimate at how much your bathroom remodel will cost, contact the local contractor you plan on using for your remodeling. Most of the time, homeowners end up going over budget in the middle of the project. This usually happens when homeowners decide in the middle of the project that they want to change something. That’s why it’s important to outline every aspect of your bathroom remodel with your contractor. During the outline and designing phases, you will be able to choose every aspect of your bathroom. Feel free to take advantage of the samples and pictures your contractor has, so you can be sure the aspects you’re choosing are what you really want.